It has been so chilly with the big freeze going on that it has been hard to get the pups outdoors to some exploring. 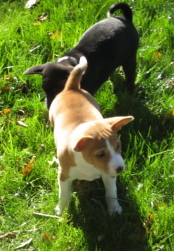 Today we got some good sun without the chilly breeze so took advantage of it to get the pups outside for a few minutes. The outing was short but the pups enjoyed exploring the grass. Hopefully it will start to warm up a little so the pups have more outdoor excursions. 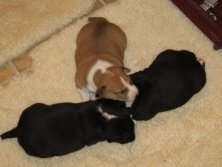 The pups are 5 weeks old now. They are playing alot more now. The more active they get the less time we have. 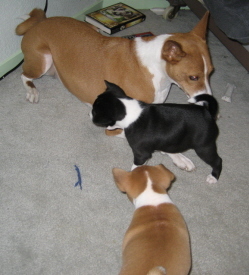 They are learning all sorts of fun basenji games like the puppy B-500 and wrestling the big dogs. 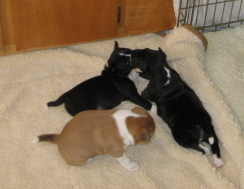 Of course, they have found it best to wrestle the big dogs with one of their siblings as back up. They are getting pretty good about using the potty box when they first wake up but still forget to head to it in time when they are playing. Unfortunately with the freezing cold weather we have not had a chance to get the pups out and exploring the great outdoors but they are having a blast exploring the nooks and crannies of the kitchen. The pups have had several new things this week. They are now spending their afternoons in a larger space so they can play with the tunnel, wobble board, and toys. They also are getting used to having collars on. Right now the run around itching every time we put them on but they get a little better each time. Every so often they forget they have them on and go back to investigating and playing. They boys have their ears both up and their tail have nearly a full single curl. Sophie has one ear up and one ear down and just a little bit less of a curl. The pups are quite active now. They are playing more and more during the day. Yesterday we introduced them to the wobble board. They walked across it making it tilt and didn't seemed to be bothered at all by the ground moving beneath them. They also had some visitors yesterday, my family stopped by since we missed the Holiday gatherings. I thought all the excitement would mean somewhat calmer pups today but they were up at 6:30am ready to play. They are interacting with the adults more and more. Nicky spends only limited time with them not wanting to put up with the sharp puppy teeth for too long. Rio has been a great big sis wrestling with them and letting them crawl all over her like a jungle gym. The pups turned 4 weeks old yesterday. They are enjoying exploring their environment. 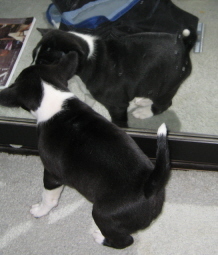 Today they discovered the mirror in the bedroom and had fun playing with their reflection. Tomorrow we will introduce them to the wobble board and see what they think. So far they have taken the new things in their environment in stride. All the pups are eager to eat their mush. It took the boys a couple of feedings to catch on but they really like meal times now. They are also playing more and more each day. 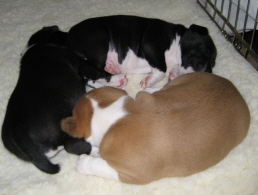 It is harder and harder to get pictures of them since they don't stay still much when they are awake. They love people and will come bounding over when they hear our voices. 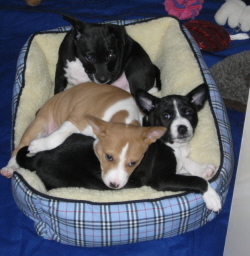 They also seek a nice lap to take a nap in after play sessions. It will probably be harder and harder to keep this blog up to date the more and more active they get. 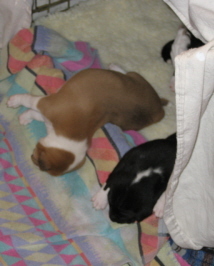 The puppies are up on their feet a lot more now. They are also starting to play more. I bought them a cat tunnel on Thursday. It is small and fits nicely in the puppy room. It also makes a crinkle sound. The pups love it. They like the sound, they like walking through it, they like sleeping in it. We will keep adding things to their environment to help them get used to coping with new things and prepare them for the "real world". They are also having visitors now. They love when people visit. They like being held and interacting with people. 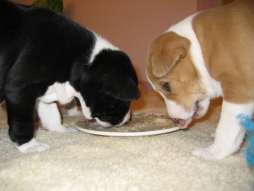 From now until the pups go to their homes we will have their new families over to play with them and socialize them. We also have friends, family and co-workers all over to help socialize them so the pups have an opportunity to meets lots of people and get used to being handled and played with. The pups are starting to walk. They now crawl out of their crate and explore their puppy room. They are still pretty wobbly on their feet. Chili gave Sam a bit of scare today. I took Rio to get her OFA hip x-rays today. When I left the pups were out exploring their room. Sam beat me home and went upstairs to check on the pups. 1, 2 ... where's 3? He looked in the crate, and under the bedding, no Chili. He could hear Chili but couldn't figure out where he was then he saw him, behind the crate. Apparently Chili got a little carried away with his explorations. Sam rescued him and he was happy to curly up with his siblings to take a nap after his adventure. The pups are getting big. We took the pig rails out of the whelping crate so they will have more room and be able to start exploring more. They are taking advantage the extra space even. I have seen both Pep and Sophie crawl out of the crate to pee. We are going to try to litter train them so now that they are crawling out of their crate to pee we will see if we can get them to go to the box to pee. It should be an interesting week as they get better on their feet and start moving around more. Our families came to visit last night for Christmas Eve. The pups were all happy to be the center of attention. They really love being held by people and will move toward a warm lap to sit in. They were all worn out by the time everyone left.